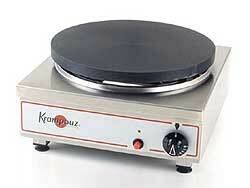 The Eurodib Krampouz Crepe Griddle is gas and features 15-3/4" dia cast iron griddle, 8 branch burner, thermocouple safety device, piezo push-button ignition, burner insulation system, security thermostat control, wooden spreader and spatula, and square stainless steel frame. 24,000 BTU, UL, cUL, NSF, CE. Dimensions are: 7.75(h) x 17(w) x 17.5(d). 15-3/4" dia cast iron griddle. 24,000 BTU, UL, cUL, NSF, CE. Dimensions are: 7.75(h) x 17(w) x 17.5(d).